Perhaps ‘anything’ you are becoming dyspeptic yourself! But why, fellow Rotarians does so much of what we do have to revolve around food? Yes, yes, I know that fellowship is an important part of the Rotary mandate, whatever that may mean, but it seems to me that for many clubs, and I am not singling RC Senlac out for criticism in this regard. They are an excellent club and have one of the truly most forward-thinking and independent overseas actions of perhaps any club in our District. They also happen to be one of the best correspondents to the blog site, even following the sad death of Senlac Press Officer, Rtn. Wendy Cocker recently, and the picking up of her batten by Rtn. Colin Goldsack, without a pause. I nearly missed it, but now on my Netbook, while deleting e-mails I pause, to look at the photos. The Burns Night supper is a regular with Senlac, and they do a night for ‘The Bard’ too. I mean William ‘Swan of Avon’ Shakespeare, on St. George’s Day. But I repeat – Rotary is frequently, in my opinion, too frequently, more about taking on board far too many calories – Christmas Dinner, Ladies Night, Triennial Bashes, you name it, clubs eat it, and not enough about our ‘core’ activity. “What’s that Guv. ?” Well, unless I have got it all terribly wrong, it is about giving service to our community and others overseas, both by personal service and by financial donations on Club, District and National levels, and through TRF -Rotary Foundation. So although this posting may be regarded by some as ‘unfair’, other Rotarians may say – perhaps ‘Anything’ old thing, you have a point, and horrors, perhaps ‘the meal’, the centre of the Rotary meeting, has become part of ‘the problem’, not part of the solution. If we were to give more of what we spend as meal fees to er- the Yellow Men of Kadongdong, RC Senlac’s major action, we would be looking slightly less portly, and doing more good where it is needed. Pic. Pres. of RCS Bob Wren and Pipe Major pipe in the haggis at The Highwoods Golf Club, E. Sussex late last month. P.S. As well as Scottish dancing – phew – so that’s where the calories went! Also Mike Stewart, one of the co-ordinators of ‘The Yellow Men’ was honoured as an Honorary Rotarian. More power to his elbow! Hey you don’t have to be mad to join Rotary, but………. 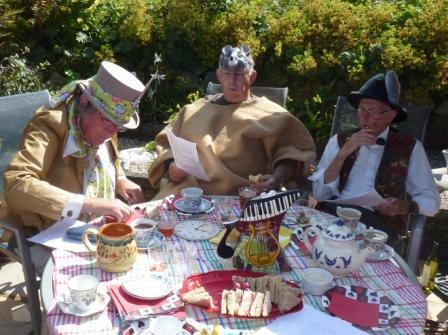 A summer’s afternoon, cucumber sandwiches, and a bottomless jug of Pimms, where am I? Actually in the garden of Peter and Wenche Georgiadis, two members of RC Hastings. And what are all these people doing dressed up as – it looks like characters from that classic of children’s bed-time reading, ‘Alice in Wonderland’. Now the more cynical of you may say that Rotary is quite like the adventures of that eponymous young lady already, without members trying to make it even more so. 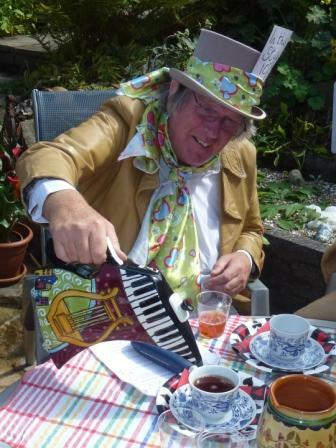 Anything would just say that they were doing it in a very good cause, the International committee of that club had a ‘mad hatter’s tea party’ member Alan Russell devised a quiz with some suitably wacky answers, they had a paper plane competition, who’s flew the furthest? and had sandwiches, cakes and jelly. And to add to the merriment the weather was fine and the Red Arrows gave an unscheduled fly-past. Summers are made of this. and the bottom line? £500 for Aqua Boxes. 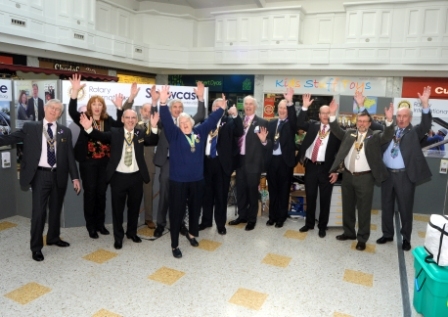 Congrats to all, the sort of fellowship and fund raising that Rotary stands for! The advantages of an active contact club were made even clearer at last Friday’s meeting. Young flautist Luce Zurita, sponsored for her studies at the London Royal College of Music by the Rotary Club of Rouen, one of Hastings’ contact clubs. 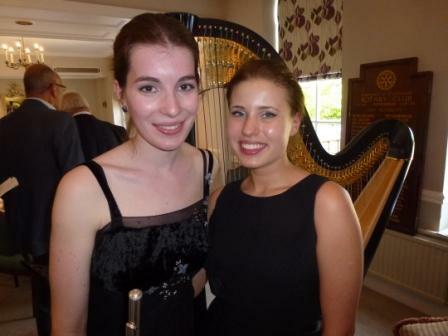 She and her friend Valeria Kurbatova, a harpist, gave the members, and their guests, a concert of spanish music. Now travelling with a harp is never an easy matter, so to do it by train to Hastings was even more of an operation. The programme included pieces by Ravel and Bizet, and concluded with Antonio Zamara’s Casilda Fantasie’ written specifically for flute and harp. One of the guests was RC Rouen member – Jean-Marie Desjardins who travelled to Hastings so that he could be at the concert. But then for a club that sings its grace! they too were able to say to Luce and Valeria – “Thank you for the music”. A remarkable celebration by the Rotary Club of Hastings on Wednesday the 19th of September, summarised 90 years of Rotary achievement. District 1120 Governor, the Mayor of Hastings and more than 100 Rotarians including French and Taiwan participants in addition to other British clubs were greeted by the club president Raymond Barrett and members of his club. All present enjoyed the well organised event and the fellowship spirit at the Montgomery Suite at Bannatyne Hotel & Spa, Hastings. District Governor Stewart Grainger conveyed to the audience the congratulations of Rotary International President. The event had a 1920s theme entertainment- Thanks to Pauline and her talented young ladies who dazzled the audience with their performance. Attached are photos from the event courtesy Rotarian Ray Dixon who and his wife invited the guest Rotarians to a generous brunch at their residence the next day. On Wednesday 19th September 2012 the Rotary Club of Hastings will be celebrating the 90th Anniversary of the granting of its Rotary Club Charter in 1922. The event will include a 3 course meal dinner + coffee and petits fours including wines on the table and a range of 1920s themed entertainment at a cost of £30.00 per person, and will be held at the Montgomerie Suite at Bannatyne Hotel & Spa, Battle Road, Hastings, TN38 8EA. Please let us know of any special dietary requirements. Please send confirmation and number of attendees as soon as possible and cheques made payable to the Rotary Club of Hastings are to be sent to the following address: 12 Harlequin Gardens, St Leonards-On-Sea, East Sussex, TN37 7PF. Cheques will not be paid in until the 10th September 2012. As the fortunate President, it is my privilege and pleasure to invite you, your partner and other members of your club and their partners. The evening commences with a reception at 6.45 pm, followed by dinner at 7.30 pm. Dress code is formal – Black tie and Rotary Regalia. I do hope that you and your club members and partners will be able to attend this function and I look forward to hearing from you that you are indeed able to come and help us celebrate this milestone in our Club’s history. We have made special arrangements with Bannatyne Hotel and Spa for a double room at a cost of £87.50 B&B (for 2 people). Please when dealing directly with the hotel for your booking, mention that you are attending the Rotary dinner on the 19th September to get this special rate.